Anyone waiting for final proof that Washington needs a second special counsel got it Friday. The breathless anticipation over whether Attorney General Jeff Sessions would fire Andrew McCabe before McCabe’s FBI retirement began was a ridiculous exercise better suited for a television game show. 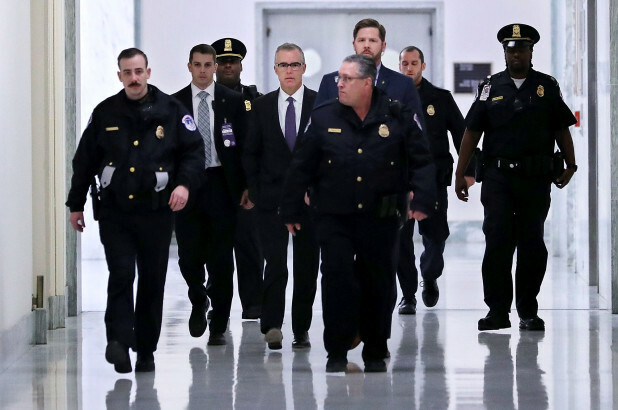 The pressure built because if he survived Friday, McCabe could retire with a lifetime pensionestimated to be worth $1.8 million. But if Sessions followed the recommendations of Justice Department lawyers and fired McCabe for wrongdoing before the witching hour, the former deputy director would get no pension and might face a criminal investigation. The absurdity was not negated when Sessions finally fired him late in the evening. Either way he ruled, the spectacle was not worthy of the grave issues involved. That the drama played out on the same day that news broke that the existing special counsel, Robert Mueller, subpoenaed records from President Trump’s business organization highlighted the disparity between the no-holds-barred way Trump is being probed and the slapdash, unserious effort to uncover anti-Trump wrongdoing in the government. McCabe is among the top law-enforcement officials and others in Barack Obama’s administration who appear to have used their official powers to try to prevent or undermine Trump’s presidency, yet there is no single investigation focused on this dark chapter in American life. This politicized double standard must end. Like many, I have doubts about the wisdom of a second special counsel. As Mueller and others before him have proven, once they begin, special counsels are reluctant to stop. There is no applause for coming up empty-handed, so the incentive is to continue until they get a scalp or three. Another problem is that special counsels operate without clear accountability, especially when, as in Mueller’s case, they are appointed by officials despite presidential objections. Yet those concerns now pale next to the accumulation of evidence of serious and widespread wrongdoing during the last two years. Although the Inspector General of the Justice Department was the first to flag McCabe’s “lack of candor” when asked about a media leak, McCabe would not be required even to answer the IG’s questions after he retired. The same is true for former FBI Director James Comey despite serious suspicions about his conduct. Similarly, top Obama officials, such as James Clapper, Susan Rice, John Brennan and Loretta Lynch, who likely played various dirty tricks against Trump, are no longer subject to internal probes. A criminal investigation, then, is the only way to find out who did what, and to connect the dots between various agencies, such as the FBI and State Department, that reportedly worked secretly to help elect Hillary Clinton. Yet a routine criminal investigation, conducted by the Justice Department and the FBI, isn’t the solution, either. Asking those departments to investigate themselves when they are still stonewalling Congress and private lawsuits over internal documents guarantees a whitewash. All of which makes a special counsel essential. He or she could be appointed by the attorney general or a deputy if Sessions’ recusal prohibits his involvement. The starting point should be the leak probes Sessions launched. Those have to do with classified material fed to the anti-Trump media during and after the election, some of it improperly unmasking Trump associates caught up in surveillance of foreign nationals. The leak probes are important in their own right, but even more so because they might involve people who also allegedly engaged in other wrongdoing aiming to tip the election. For example, McCabe, in addition to leaking, reportedly waited nearly a month before examining thousands of e-mails, some classified, that Clinton top aide Huma Abedin sent to her husband, Anthony Weiner, the sexual pervert now in prison. Some fellow agents reportedly believed McCabe was trying to run out the clock on the election because the e-mails might have hurt Clinton. Those suspicions must be investigated, especially because McCabe’s wife got more than $600,000 for a state legislative race from Clinton ally Terry McAuliffe. Oddly, McCabe recused himself from the rigged Clinton probe a week before the election — despite having helped to direct it from the start. Then there are the FBI lovebirds, Peter Strzok and Lisa Page, who have much to answer for under oath, including their talk of an “insurance policy” in case Trump won the election. That conversation took place in “Andy’s office,” almost certainly a reference to McCabe, their boss. Their involvement took another turn last week when texts revealed Strzok was close friends with the federal judge who initially presided over Michael Flynn’s case. The judge, Rudolph Contreras, later was replaced, with no reason given. And don’t forget that the FISA application to spy on Carter Page appears to have been a tissue of lies and omissions that some lawyers believe rises to criminal conduct. Again, McCabe and Strzok, along with Comey, were key players. In short, there is a mountain of suspect behavior a new special counsel should dig into. All that’s missing is someone with a shovel.